In 2011, JISC convened four regional Conversations Conferences on Nebraska Environment and Sustainability Issues (CCNES) , centering on how we might both preserve and develop vital resources within Nebraska. Nebraska is unique in its abundance of land and water, its potential for food and energy production. These four critical resources, along with a fifth important resource—materials, were the focus of the Conversations. The ultimate purpose of the Conversations Conferences was to synthesize the ideas and recommendations of the people across the state regarding both the development and conservation of these resources and to then influence public policy with sustainability in mind. “Our goal is to document a sense of public interest and public concern and public recommendations that we can pass on to civic decision leaders for public policy and consideration for change,” said Joslyn Institute President Cecil Steward. 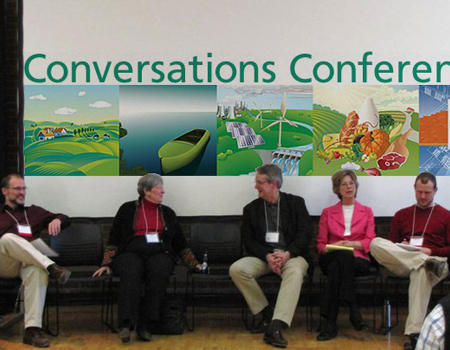 The Conversations Conferences, following in the footsteps of the Nebraska Sustainability Leadership Workshops (NSLW), were designed to help to create a stronger, more sustainable network of sustainability leaders in Nebraska by raising the level of discourse within the state to achieve greater awareness—politically, economically and socially— for conservation-based development of the state’s essential resources and to formulate recommendations for both public policy and future action. In its unusual format, JISC offered participants the opportunity to engage in a new way of approaching communication, critical thinking, idea generation and development of public policy and action principles. Five breakout conversations were convened concurrently throughout the day, each focused on one of five designated Nebraska Resources. Participants engaged in one conversation per each resource during the course of the day. 1) Sustaining Nebraska: What does environmental sustainability mean to Nebraskans? Why does it matter? What can we do about it? 2) Nebraska Resources: What do we need to know about Nebraska’s natural resources? What does it mean to be stewards of critical Nebraska resources—water, land, food, and renewable energy. 3) Sustainability Indicators: Environmental, Socio-Cultural, Economic, Technological, and Public Policy. What can we learn from local leaders who have begun to initiate conversations needed to identify and adopt sustainability indicators for their communities leading to the development of a comprehensive plan, and implementation of strategies and actions needed to achieve measurable indications of progress? 4) Being a Leader and Leadership Practices: Engaging others in meaningful conversations of change. What are we learning about practicing leadership with others? What have we been experimenting with to enhance our leadership effectiveness? 5) Action Action Action: Now what? Where do we begin? What is the next priority I must focus my attention on? How can we pick up the pace? Sustain momentum? The Conversations Conferences brought together more than 600 participants and experts from the NSLW workshops with other educators, ranchers and farmers, business leaders, agency and organization members, and other leaders throughout the state. The Conversations Conferences were held at Creighton University in Omaha, the University of Nebraska–Lincoln, Central Nebraska Community College in Grand Island, and Western Nebraska Community College in Scottsbluff. The four schools were JISC’s partners in developing and producing the Conversations. As a follow-up to these, JISC is developing a video project centered on the recommendations and calls to action that were formulated during the Conversations. The hour-long video will be provided to educators as well as broadcast media in an effort to continue and grow the education of Nebraska’s sustainability leaders and the conservation and development of Nebraska’s critical resources.